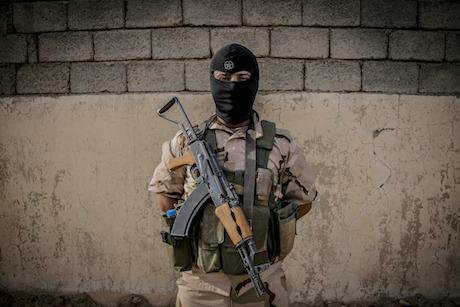 A Peshmerga soldier poses for a portrait at the DPK Peshmerga base. Picture by Le Caer Vianney ABACA/PA Images. All rights reserved. Some people in the Kurdistan region of Iraq think of security in terms of security of Kurdish people and their territory from military attacks by neighboring countries or the self-proclaimed Islamic State of Iraq and Levant (ISIL). This understanding of security, however, is a limited one. Security should be thought of as a shared freedom from fear, from want, from medically preventable deaths, and freedom to live in dignity. Today, the people of Kurdistan and their land are secure from ISIL threats, because Peshmerga forces (literally meaning those facing death or seeking death) were successful in fighting back and protecting the Kurdistan territory from falling into ISIL's hands. However, the main and serious security threats on Kurdish people's lives derive from within the Kurdistan region and the failure of its regional government (KRG). Corruption and economic inequality are at their highest, and the KRG is unable to provide salaries for its public employees. Under a recently announced plan named the ‘savings process’, the KRG proposed wage cuts to all public employees in a bid to reduce costs. Government employees are facing cuts ranging between 15 and 75 percent, depending on their position and pay-grade. Furthermore, employees have not been paid four monthly salaries in 2015, and two salaries have been delayed in 2016. Having said that, KRG’s economic reforms are at the expense of poor people: "Making the rich richer and the poor poorer". Many Kurds believe that the ruling political parties are still rich and corrupt, since they still finance their media outlets and institutions, and have even started new projects during the financial crisis, including opening new TV channels. The results are clear: economically speaking, people live in severe conditions, and therefore tens of thousands migrate from the area. Another consequence is that, according to recent reports the crime rate is going up in Iraqi Kurdistan. KRG’s economic reforms are at the expense of poor people: "Making the rich richer and the poor poorer"
Moreover, the KRG health care system is in poor condition. In theory, hospitals offer free services, but in reality they are badly equipped and poorly serviced. The drug supply business has no quality control and is not regulated. Many Kurdish traders import expired drugs from neighboring countries. In the Kurdistan region, almost 20 percent of the entire medical supply is fake. In 2013, a group politically linked to the ruling party, smuggled a contaminated batch of the cancer-treatment drug Avastin. When the drug was used by a public hospital in Erbil, it blinded 30 patients. The traders who deliberately imported and sold the bad drug were not held responsible. According to Michael Rubin, in Kurdistan Rising? Considerations for Kurds, their neighbors, and the region, “in March 2012, Kurdish authorities uncovered a counterfeit medicine plant in Erbil packaging substandard drugs with false claims of manufacture in Syria and India, but issued only a reprimand because of its owners’ political connections. Corrupt traders and manufacturers distributed more than 2,500 boxes of defective insulin to Kurdish hospitals. Numerous cancer patients received defective chemotherapy drugs, and patients receiving injections for minor medical issues subsequently suffered life-threatening reactions. A relative of a former KRG prime minister working at a border crossing with Turkey allowed in 20 trucks carrying 400 tons of counterfeit medicine, but the contents of only one truck were ever recovered." Kurdish authorities overlooked an Iraqi Ministry of Health circular to all Iraqi and Iraqi Kurdish hospitals that banned injections of the antibiotics ceftriaxone, resulting in the deaths of several patients. The Minister of Justice is sometimes used by the ruling political parties for their own interests. There are numerous cases indicating that Asaesh ignored the decision of the court. Furthermore, the Minister of Justice is sometimes used by the ruling political parties for their own interests. For instance, at the request of the deputy speaker of the Kurdistan parliament, who is a senior politician at the PDK, the Kurdistan Consultative Council on 17 August 2015 decided to extend Barzani's term for the next two years. The decision according to the Kurdistan parliament speaker Yusuf Muhammad, was illegal. "We did not ask for an opinion and according to the law, the consultative council does not have the right to issue an obligatory decision" Yusuf Muhammad said. All of these cases imply that in Kurdistan the law can only be enforced upon powerless people. The security of the system per se is just a means to serve an end, which is the security of people. Last but not least, the largest Kurdish political party ended the soft treatment of anyone who criticizes the Kurdish political leaders for corruption in the areas under its control. In October 2015, the security forces loyal to the PDK prevented the Kurdistan Parliament Speaker Yusuf Muhammad from entering Erbil just because he was trying to do his job as the speaker to amend presidential law. The KDP has expanded its surveillance system by recruiting more people. They mostly target domestic rivals and civil society activists. NGOs and civil society need prior permission from Asaesh before conducting any activities. Many journalists who work with the opposition groups in Duhok and Erbil left their journalism jobs under pressure. Several religious scholars who have critical voices have also been fired. Kurdish officials are the main beneficiaries from the current political system by politicizing all sectors of society while the human security of Kurdish people is under threat. The Kurdistan security strategy should not only focus on external military or terrorist threats. Today Kurdistan is largely stable thanks to the Peshmerga forces, but at the same time it faces many risks that endanger the lives of Kurdish citizens. Moreover, the KRG security and stability should not become a project to serve the political elites and their interests, but a common good benefiting all Kurdish people in the Iraqi Kurdistan. To achieve this goal, politicized sectors such as the military and security forces, economy and oil revenues should be depoliticized. Also, the KRG's security and intelligence services have to assess the level of the mentioned threats, measure their severity, and then try to find ways to resolve them. This is because these threats affect Kurdish people's lives directly, which should come first in the KRG's security strategy. The security of the system per se is just a means to serve an end, which is the security of people.